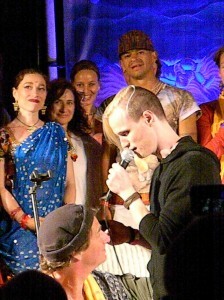 The Bhakti Beat @ Shakti Fest: It was one of those quirky moments that Bhakti Fest is becoming famous for, like the two weddings last year. No matrimonials occurred during this year’s fest, but a young man named “Irish Dave” did get the ball rolling after Jai Uttal’s set Saturday night at Shakti Fest. Ooops that’s not it. Hahaha, couldn’t resist this crop. Talk about pressure. 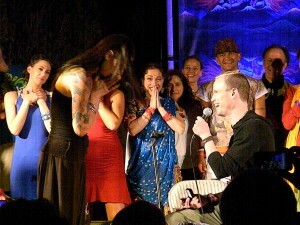 Thankfully for Irish Dave’s ego, the object of his adoration, Tonia, said yes. Make that, SCREAMED yes!